THEY came to win, but no one expected them to be so incredibly dominant, or for them to make just one successful pass, that would obliterate the existing 1000 metre national record. 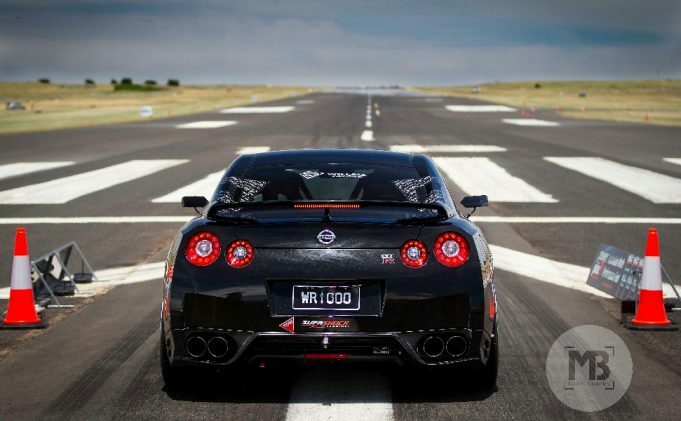 If you’d said it was possible to be the very first car to hit the track at 8.30am at last Saturday’s Snowy Mountains 1000 at Cooma Airport, and for your pilot Kier Wilson to steer the R35 Nissan Skyline GTR to an incredible 328.3km/h 16.82 second pass – almost every pundit at the event, or following the Exhaust Notes Australia live coverage, would have said no chance. The fact at least one other car broke the existing 322km/h mark set at Race Wars is simply incredible. A multitude of drivers joined the 300 club, a testament to an eventful day that say plenty of outstanding performances, and some amazing racing. The race win was a three-peat for Willall Racing, who ran a completely new incarnation of the WR35BB Billet Engine block, to an outstanding end in their first run. That would be it for them though, after a faltered second run where they could only manage 259km/h revealed a damaged all-wheel drive system – forcing the team to park the car for the remainder of the day. Matt Davis was the next to break the 300 barrier, with a 304km/h, before Darren Maxwell punched out a whopping 317km/h pass to a massive roar from the growing crowd. Maxwell would later punch out an incredible 323km/h in his Toyota Supra. It was a good day for Toyota, with Jamie Heritage putting away a 311km/h 17.21 second pass in his outstanding looking Celica. Skyline pilot Adam Neish also put his name on the 300 club trophy with a 310km/h 18.1 second pass in a fantastic day of racing, that saw a handful of engine failures and blow ups in hot windy conditions play havoc with the event plan. Other stand outs on the day were fastest female driver Sally-Anne Hains, who ran a 273.5km/h pass in her Porsche 911 Turbo, Tristan Triccas’ V8 Ford Capri that punched out a massive 307km/h run, and the Jeep Grand Cherokee SRT drive by Emmanuel Dalakakis, which put away a 278km/h 18.48 second belter. The remaining class winners included Anthony Burke, Wayne Penrose, Paul Fisher, Robert Duggan, David Chinner, Scott Norman, Tate Healey, Brian Needs, Nicole Page and Mathew Cameron. A great day it was. Spectators and crew were keen for a challenger to better the record and we were there for the event..